This is a phone which connects directly to the USB port on your Windows PC. By connecting it to your computer you can make free calls via VoIP (software included free) to other PCs without losing the familiar feel of a standard telephone handset. If you need to make calls to ordinary fixed lines you will find numerous telephone companies who let you connect via VoIP using your broadband connection for excellent rates. The Express USB Phone will be an asset when spending a number of hours on the phone whether you’re running a business or catching up with overseas relatives. Commercial grade high quality speakerphone. Selectable ring style and volume for incoming calls. 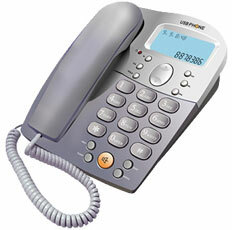 Suitable with free Express Talk VoIp Phone Software but works with other voice chat software. Free VoIP to VoIP calls and much cheaper calls to ordinary if your telco has a as Sip VoIP Gateway Service.